What would be black without white and white without black? I am not making a metaphorical combination here (although I believe it could make some sense) but since I started to draw and design clothes when I was a young teenager, I always had a preference for black and white colors. I already shared with you my admiration for Pierre Soulages‘ work and his ‘outrenoir‘ (beyond black) concept in Pierre Soulages: black like you never saw it before. Pierre Soulages, also known as ‘the painter of black’ allowed me to think in black and to assume the black color as the source of my creative process. But someone else later confirmed my black and white world could go way beyond and exists by itself in our everyday furniture; this person is Andrée Putman. I was impressed when I first saw Putman’s signature monochrome graphics she created at the Morgans Hotel in New York in 1984. I only discovered her work a couple years later but then I was convinced black, and black and white were ‘it‘, the essence of my inspiration was there, inspired by amazingly creative people such as Pierre Soulages and Andrée Putman. 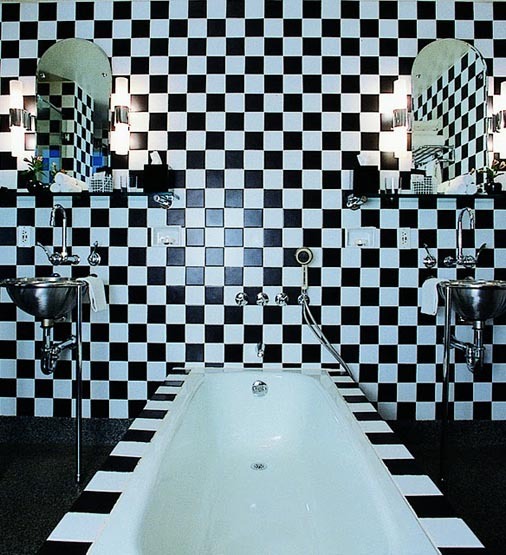 The often called ‘Queen of the checkerboard‘ is also known as the ‘Ambassador of French style‘ and her work was inspired by Robert Mallet-Stevens and many other designers from the 1930s (one of my favorite era). Aged 85, the tall and extravagant ‘grande dame of French design‘ is still one of the world’s leading interior designers. Putman is honoured by a retrospective exhibition which started last November at Paris City Hall (Hotel de Ville, 5 rue de Lobau, 75004 Paris). I visited it last year and it is very well done, with many of Putman’s works including the ‘Milky Way’ piano, Trompe l’Oeil tables, the Black coffee table and Crescent Moon sofa, and also a reconstruction of the bathroom from the Morgans Hotel (see photo below). I had a great time but I regret we had to wait outside in a freezing wind for half an hour. It was worth it although a better organization would have been appreciated, the place was not big enough to let everyone enter. But I recommend the exhibition if you plan to visit Paris. Be quick, the exhibition will close on February 26, 2011.